At just Rs. 7992/- Idea Blade now available in India. Idea Blade is the newly launched self-brand android phone from Aditya Birla Group Idea company. The Idea Blade 3G phone power is provided by 600MHz processor and this device runs on Android 2.2 OS. 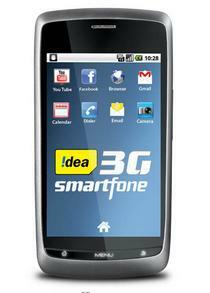 Specification wise The new Idea Blade features a a 3.5-inch touchscreen display with 480 x 800 pixels screen resolution. a 3 mega pixels camera for high quality video recording and playback. Multimedia wise The Idea Blade Android smartphone equipped with music player, speakers, 3.5 mm audio jack, 150MB internal memory which can be expanded up to 32 GB through microSD slot card.. Connectivity wise The Smartphone from Idea cellular supports USB, Wi-Fi, and Bluetooth. Now will see Idea Blade smartphone more features , specification and what is actual price in India ( including Bangalore, Delhi, Mumbai, Pune, Hyderabad, Chennai and other cities in India).